Stays during the low season Sunday to Friday there is a 10% discount on pitch fees for stays of 2 nights or more. For stays of 7 nights or more there is a 10% discount on the pitch fees. Our luxury bell tent is available from the 27th April until the 1st October 2018. Bookings commence on Friday’s, 3 or 7 nights or Monday’s, 4 or 7 nights. The fee for a 3 night weekend is £199, 4 night mid-week £199 or a full week for £399. 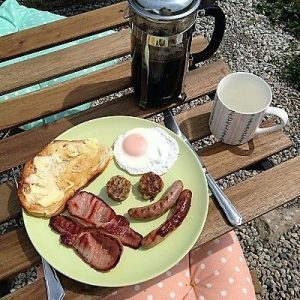 We can supply a breakfast basket – 12 rashers of back bacon, 12 sausages, a choice of Black or hogs pudding, ½ dozen eggs and a ½ bloomer of bread for £15 or a meat feast BBQ pack for £20, both supplied by Farmer Luxtons. Notice is required please email to order. Payment can now be made by card over the phone, by bank transfer, details on request or by cheque. Advance booking is advisable to reserve a pitch for WEEKENDS and SCHOOL HOLIDAYS. Minimum nights stay restrictions apply at certain times, please check when you are booking.